Bed bugs are tough to control. They are difficult to see and are active at night when humans are sleeping. A female lays 2 to 3 eggs per day and may lay 200 to 300 eggs in a lifetime. They can go without food (blood) for up to 140 days. They hide in cracks and other small places, and are especially difficult to see in the early molting stages. The eggs are very small and almost invisible to the naked eye. Since the elimination of DDT and Chlordane several decades ago, the problem has become widespread. Bed bugs live in clusters, like roaches. They will travel 20 or more feet from their nesting area if the host moves to another location. They have been known to move downstairs if the host goes from an upstairs bedroom down to the living room. They prefer to feed at night, but will feed during the day if the host is inactive. You may need a flashlight to locate the bed bugs. They will hide in bedding, bed frames, couches and chairs, window and door moldings, cracks in flooring, behind wallpaper and pictures, under carpet along walls, inside wall voids such as light sockets and outlets, and in personal items such as luggage, backpacks and clothing. 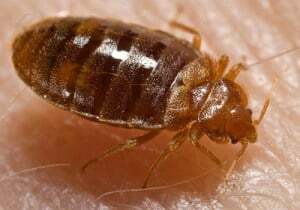 In laboratory tests, bedbugs have been found to carry the causative agents for several diseases such as Yellow Fever and Typhus, although they have not been found to transmit diseases. Without treatment, the bed bug problem will not resolve itself and in fact will spread. Professional treatment may take several hours, but with your cooperation, we can win this battle in your home. We treat your home with the most advanced insecticides, dusts and traps on the market today. We treat baseboards, furniture, mattresses, box springs, frame rails, headboards, carpeting, electrical outlets, trim work, etc. We can also supply you with bed bug eliminating box spring covers called Active Guard which are designed to prevent and eliminate infestations for up to a 2-year period. Our highly trained technicians can provide you with more information and pricing on our bed bug services.